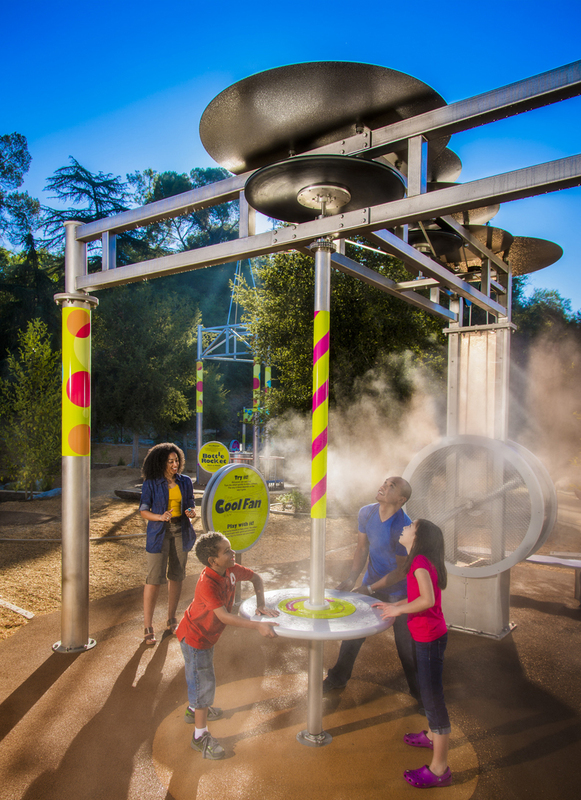 Outdoor Cooling Systems collaborated and provides the Misting Direct brand misting equipment used on this interactive exhibit. 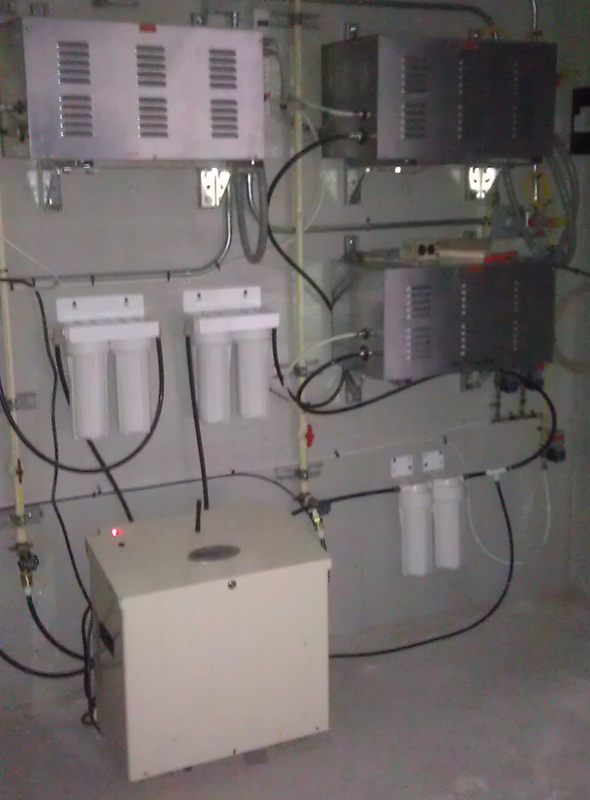 A high pressure misting system was incorporated into this custom project. We worked with the fabricators and designers of this exhibit and provided the high pressure misting equipment. We have extensive experience in designing various types of systems for outdoor cooling, fog effects, process cooling, humidification, dust control, odor control etc. 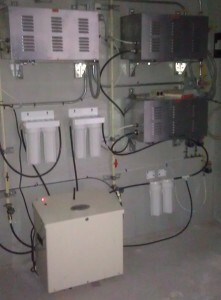 So contact us for assistance designing a custom misting or fogging system for your unique project. Protect your investment by maintaining your equipment. We service all make and models of misting systems so give us a ring for professional service! Maintenance of high pressure mist cooling systemsa will help you get the most out of your system and prevent many common problems. High pressure mist cooling systems require excellent filtration to protect your pump and prevent the nozzles from getting clogged. Mist cooling systems should also be flushed when the filters are replaced. Many high pressure misting pumps required periodic oil changes, the time between oil changes can vary from manufacturer to manufacturer. Feel free to ask any questions you may have if you are planning to do the maintenance yourself. Or call now to schedule you preventative maintenance. Outdoor Cooling Systems designed and installed this misting system in Coral Gables. For maximum durability and corrosion resistance our type 316 stainless steel tubing with welded nozzles extensions was used. Misting nozzles are evenly spaced around the perimeter of the gazebo. A MistingDirect brand high pressure industrial duty misting pump was installed remotely, on an equipment slab. Two misting fans were hidden behind the columns and provide additional cooling. A MistingDirect brand high pressure industrial duty misting pump was installed remotely, on an equipment slab. Contact us for a free estimate. 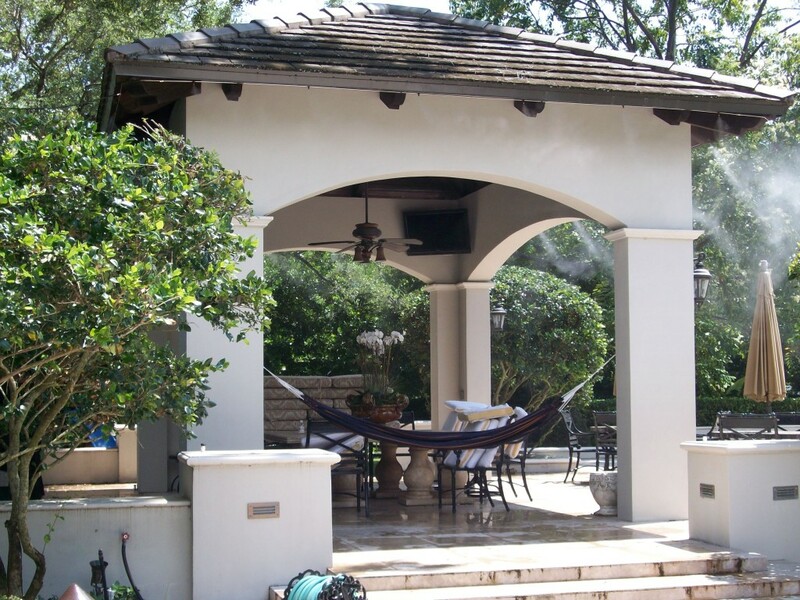 This misting system in Coral Gables was installed around the perimeter of the gazebo. Two misting fans are hidden behind the columns. The misting pump is installed remotely on a pool equipment slab. We have recently added 24″ oscillating fans to our product line. oscillating wall mount fans are UL listed for wet locations. Available in black or white, these fans have a corrosion resistant finish and are perfect for cooling patios, outdoor restaurants, warehouses, factories etc. With thermally protected fan motors, these wall mountable fans are designed to provide many years of reliable service. All of our oscillating fans come with a decorative wall mounting bracket making these the nicest looking oscillating fans we have seen. Feel free to contact us with any questions regarding our wall mountable oscillating fans. For added cooling consider adding a high pressure misting system with high pressure mist nozzles mounted to the face of the fan. High pressure mist systems can cool far better than traditional, bulky evaporative cooling systems, even in areas with high humidity. We design misting system for semi-enclosed spaces to distribute the ultra fine mist into the air to cause an adequate amount of evaporation to effectively and efficiently cool the space. The amount of mist being introduced into the space can be regulated and an interval misting timer can provide total control of the system. When using a mist system to cool enclosed spaces its very important to have adequate amounts of air being exchanged. The changing air prevents the mist system from causing humidity to build up. This is usually accomplished with exhaust fans. As long as there is enough changing air, misting systems can economically cool large spaces. Our high pressure mist fans can be placed at strategic locations. These misting fans are UL listed, have a totally enclosed motor, aluminum blades, 3 operating speeds and a durable corrosion resistant finish. These misting fans are also widely used in restaurants, hotels, resorts, homes etc. Outdoor Cooling Systems has designed and installed many misting systems in warehouses and factories will be happy to answer all of your questions. A good start for cooling many semi-enclosed spaces is our Misting Direct brand Misting Kit. The Misting pump has enough capacity to power additional misting fans. 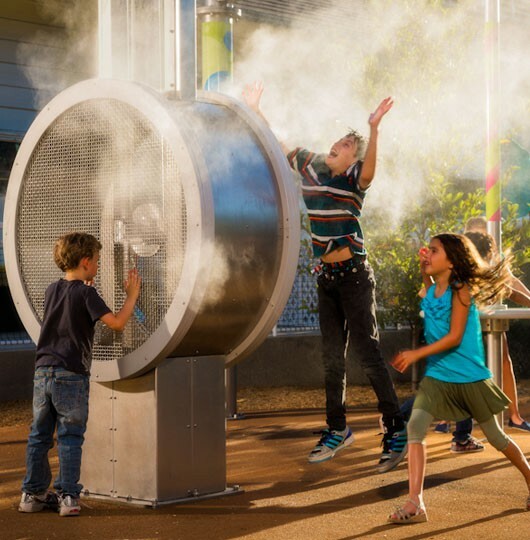 Designing a misting system for enclosed or semi-enclosed spaces can be tricky, so feel free to contact Outdoor Cooling Systems for free design consultation or to answer any questions you might have. High pressure misting systems use very small nozzles that can become clogged when not installed correctly or if they are not properly maintained. Having adequate filtration in mist cooling systems is essential to having a trouble free outdoor cooling system. For optimum performance, high pressure misting systems connected to municipal water supplies we recommend our two stage misting systems filters. In addition to quality filtration, we strongly recommend a Misting Direct brand anti-drip valve that will automatically drain the water from the high pressure mist tubing between uses. This prevents stagnant water from sitting in the mist tubing and will greatly reduce the number of clogged misting nozzles that occur. Don’t let a high pressure misting system sit unused for long periods of time. Even with a drain valve installed, small amounts of water can remain in the tubing and scale can begin to form if the water sits long enough. By simply running the misting system for five minutes once per week, clogging of the misting nozzles can be virtually eliminated. If you have a home automation system the misting system can be automatically cycled to prevent stagnant water from sitting in the mist tubing for long periods of time. It is also recommended to flush the misting system about every six months. Simply remove the farthest from the pump and turn the misting pump on. Allow the water to flow freely for 3-5minutes. Regular flushing of the system is essential to having a trouble free mist cooling system. Use quality misting nozzles. Our premium ruby misting nozzles can be easily disassembled and cleaned again and again. Most other brands of high pressure misting nozzles can’t be disassembled and once they become severely clogged, they are not cleanable. Our ruby misting nozzles have a real ruby orifice that will not wear down over time from the high pressure water. Following these simple steps can keep you high pressure misting system running great so you can enjoy the outdoors! Design your high pressure misting system with seperate zones for maximum versatility. When designing a high pressure misting system consider setting the system up in zones that can be independently turned on or off. We carry manual high pressure shut-off valves as well as high pressure misting solenoid valves. The electrical misting valves can be operated by a simple switch or can connected to and controlled by various automation systems. You may want too for example, turn off the misting nozzles on the patio section while leaving the fog effects for a waterfall left on. We can help you design your entire system so contact Outdoor Cooling Systems for expert assistance in creating a high pressure misting system that will best meet your needs. We carry a complete line of high pressure misting nozzles, misting pumps, nylon mist tubing, stainless steel misting tubing and everything you need to install a professional misting system. See our misting gallery or our misting videos to see some of our work. More and more disposable misting pumps have been seen on the market. What to I mean by disposable misting pumps? Many of these misting pumps are known to experience catastrophic failure resulting damage so severe it would be less expensive to replace the entire pump than to attempt to repair it. Furthermore since these units are made entirely of foreign components, getting replacement parts can be difficult. So be sure to compare the features and quality of high pressure misting pumps before buying! Outdoor Cooling Systems has designed our entire line of misting pumps to be permanent misting pumps, all parts and components are replaceable or serviceable. We service all of our mist pumps in-house and our corrosion resistant misting pump enclosures will keep your high pressure misting pumps in service or many years to come. If you buy a misting pump from us, it may be the last mist pump you ever buy. Our 316 stainless steel mist line can be installed during the construction process and covered with stucco, wood, tile etc. Only the nozzles remain visible. People are amazed when the high pressure mist comes from the building! ur 316 stainless steel mist line can be installed during the construction process and covered with stucco, wood, tile etc. Only the nozzles remain visible. People are amazed when the high pressure mist comes from the building! Stainless steel mist line was installed during the construction process.